The first discovery of coal in the Elk Valley of southeastern British Columbia was around 1845. The original landscape of the area was covered with mid- to high-elevation forests. The 14 untapped, mineable coal seams in the area of Sparwood, B.C., varied in average thickness from two to 15 metres. The Elkview Coal Mine is a mere three kilometres from Sparwood and was formerly the Balmer Mine. The mine’s history extends back to the earliest groundbreaking days in the Elk Valley, with surface operations beginning 50 years ago. The mine produces medium-volatile hard coking coal. Mining has taken place on the Elkview operations site for over 100 years: underground operations started in the late 1800s, and large-scale open-pit (surface) mining began in 1969, which this 50th anniversary is celebrating. The mine was between the towns Michel and Natal, which were established around 1900. In the 1960s, the towns were officially relocated to current-day Sparwood. The former Balmer North Mine suffered an explosion on April 3, 1967, resulting in multiple fatalities. Once the Balmer North Mine was considered tapped out, it was closed on February 28, 1986. Efforts were then transferred over to the mine’s open-pit section on Harmer/Natal Ridge. Unfortunately, Westar was unable to reach an agreement with Local 7292 of the United Mine Workers of America, and was forced to end operations there in May 1992. After Westar suffered bankruptcy in 1991, Teck Cominco acquired and restarted the Westar Balmer Mine at Sparwood, renaming it Elkview Coal Corp.
Elkview received the 2009 Coal Mining Category Reclamation Award from the BC Technical and Research Committee on Reclamation for removal and clean-up of historical mining debris at Michel Creek. Reclamation of the land around and within the mine site is ongoing. Elkview is one of the five steelmaking coal operations in the Elk Valley. Teck has a 95 per cent partnership interest in Elkview, 2.5 per cent is held by Nippon Steel & Sumitomo Metal Corporation, a Japanese steel producer, and 2.5 per cent is held by POSCO, a Korean steel producer. The latter two companies took control of their interests in 2005. The mine produces steelmaking coal (also called metallurgical coal or coking coal) that is shipped by rail to Vancouver and then via ship to Asia to be transported worldwide. Proven projections have estimated reserves at the Elkview Mine will last for another 42 years. In 2018, the mine produced 7 million tonnes of coal, and had a revenue of $ 6,349 million. The mining process occurs in a conventional open pit, with blasting occuring every two to three days. The mined material is lifted by electric shovels into the backs of haul trucks. 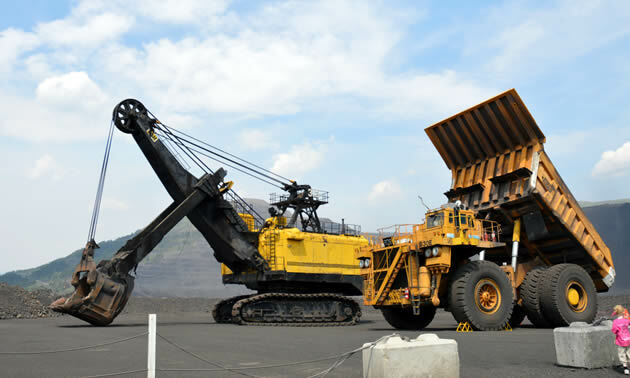 The coal is then taken to a hopper facility, where a conveyor moves it 3.5 kilometres overland to a crusher. The mine’s environmental policy focuses on the prevention of pollution, minimizing environmental impacts of activities and services related to mining operations, and raising the environmental awareness of its employees. Elkview is a major employer in the Elk Valley for many Albertans as well as Kootenay folk and currently employs around 920 people. For more information about Teck’s operations at Elkview, visit Teck’s website, the provincial B.C. mining website, this article from the Crowsnest Pass Herald and this teaching resource. Teck has been recognized by the media and investment research company, Corporate Knights, as one of 2019 Global 100 Most Sustainable Corporations. Teck received the number one spot for the company’s Metals and Mining category. The 100 companies selected have annual revenues of US$1 billion or more, and are based on a range of sector-specific sustainability metrics, such as clean revenue percentage, water and energy consumption, and safety performance, as well as financial strength and business sustainability. Teck is currently working to build partnerships and to confront sustainability challenges within the regions in which it operates, including at the global level.